With Beamery 4.0, we continue to expand our ecosystem by welcoming Jobvite as the latest ATS to have two-directional integration with Beamery, joining our growing list of bi-directional ATS integrations which also includes Greenhouse, Jazz and Workday. We have also added a number of new sourcing tool partners, including HireTual and ContextScout. If you would like to enquire about Beamery integrations, please contact your account manager or our support team at support@beamery.com. You can also request a new Beamery integration here. Beamery can now integrate directly with Jobvite allowing for a seamless two-way link between both platforms. Recruiters use Jobvite as the main tool for managing applications and the primary source of truth for all vacancies. Vacancy data is automatically pushed to Beamery and candidate applications are synced across both platforms. The integration leverages Beamery's data enrichment capabilities with new information automatically enhancing the candidate profile information. With this integration, sourcers and marketers using Beamery can streamline their workflows to push contacts into an interview and hiring process in Jobvite, after communicating with them through Beamery. All relevant data changes are mapped across to both platforms. We are very excited with this new release that fixes a few bugs, enhances our Forms capabilities, significantly enhance what you can automate in the candidate journey, and expands our ecosystem by integrating with another ATS. Beamery Forms are a powerful tool to capture all the information you need about a candidate. While this information was very useful for automatically processing candidates based on their answer, it was difficult to manage candidates based on these answers. With this release, we can now link those questions -and their answers- to custom fields. This will allow users to display those columns in the contact lists, and filter on candidate answers. 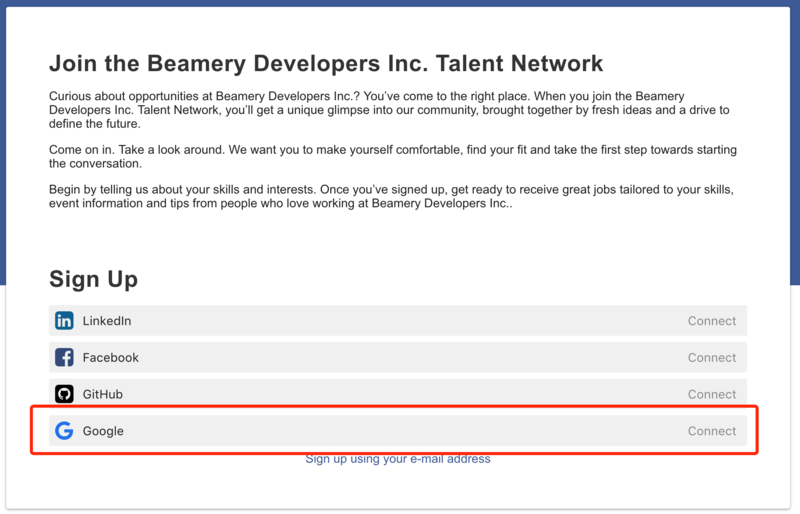 Signing-up on a Beamery Form has always been an easy process, by allowing candidates to log in with their social networks (LinkedIn, Facebook, GitHub). With this release, we are making this process accessible to an even broader audience, by adding the ability to sign-up using the candidate's Google account. In this release, you are now able to automate more than before, and in more precise ways. These new triggers allow you to automate parts of the journey that remained manual until now. These new filters allow to be more sophisticated in the journeys you build for candidates, and create different paths based on relevant candidate characteristics. For more details, you can access the help docs. The ability to send a test email when designing campaigns has been improved. You can now send a test email before having selected a list of candidates. You can also choose who is the recipient of the test email. This allows better collaboration between departments when you want team members to provide feedback on an email.